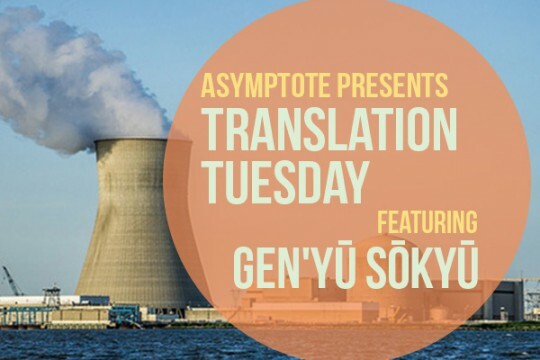 Akutagawa Prize winner Gen’yū Sōkyū has an unusual vocation among litterateurs: he is the chief priest of a temple in Fukushima, where nuclear disaster struck following the earthquake and tsunami of March 2011. Both a leader and a major voice in reconstruction efforts, Gen’yū uses fiction to grapple with the catastrophe, and in this story, “Mountain of Light”, he imagines (perhaps even hopes for) a future of provincial ascendance and “Irradiation Tours”. In this excerpt, the narrator relates his coming to terms with his father’s devotion in collecting the community’s “irradiated”—their radiation-contaminated waste, in other words. The next time I saw Dad was at Mom’s funeral. He himself would die three years later at ninety-five—twenty-five years after our last conversation—of old age, not cancer. After my mother’s cremation, he spoke to me. His hearing wasn’t so good by that time, so while I said “Don’t be stupid,” apparently what he heard was “Okay, I’ll do it,” although I didn’t realise this until much later. He held my hands in front of Mom’s altar and said “Thank you” over and over again . . . It might’ve been a misunderstanding, but that was the first time he had ever shown me gratitude.